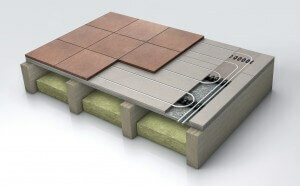 LoPro10™, Nu-Heat’s low profile underfloor heating solution, is the ideal luxury heating system for loft conversions. A quick and easy installation – simply follow the grooves in the board! LoPro10™ has a minimal height build-up of just 15mm and excellent thermal properties. It can be fitted on top of the existing floor deck, making it an ideal warm water underfloor heating solution for retrofit projects as well as new build. LoPro10™ can be overlaid with 4-6mm plywood for direct carpeting and vinyls, tiles can be glued directly to its surface and other floor coverings such as natural timber, laminates and engineered floors can be ‘floated’ directly over the panel without the need for battening. Send us an email and we’ll pop a brochure in the post. Nu-Heat is committed to ensuring that all of our products have optimum performance.